WIN The Ultimate Alaska Vacation! HAVE YOU ENTERED TO WIN THE ULTIMATE ALASKA VACATION!? 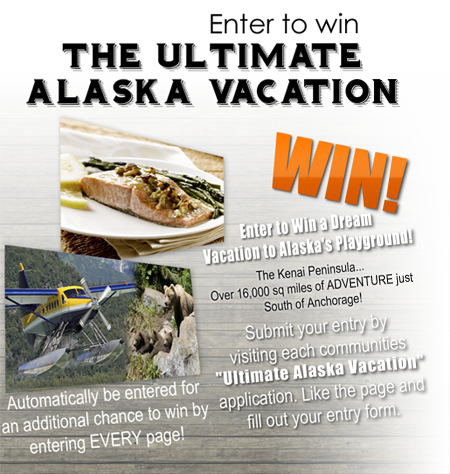 Submit your entry by visiting each communities “Ultimate Alaska Vacation” application. Like the page and fill out your entry form. Psst! By liking all 6 communities and The Kenai, you will automatically be entered for an 8th chance to win! NO AFFILIATION WITH FACEBOOK: The Sweepstakes is in no way sponsored, endorsed or administered by, or associated with Facebook. Any questions, comments, or complaints regarding the promotion should be directed to Sponsor, not to Facebook. 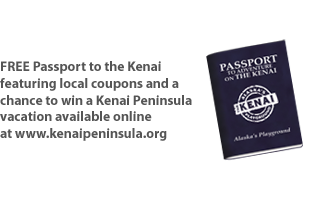 SPONSOR: Kenai Peninsula Tourism Marketing Council, 35571 Kenai Spur Highway, Soldotna, AK 99669. ©2012 Kenai Peninsula Tourism Marketing Council. Kenai Peninsula Fairs, Festivals, Camps and Markets! Here’s just a sampling of the many fairs, festivals, camps & markets taking place on The Kenai this summer. From the Kenai Peninsula Fair in Ninilchik to Alaskan crafted brew events and locally grown produce markets, the Kenai Peninsula offers the perfect mix of fun for a happenin’ summer! Great Events on The Kenai! August 6th through the 11th.